Some Eastern Vignettes. 312pp. Short stories. Very good. 1925 Second printing, Herbert Jenkins. 144pp. 121 full-colour plates. Fine in fine dustwrapper.. 2003 First edition, Roli Books, New Delhi. Three Muslim Brothers at the Sikh Court of Lahore. xxix + 467pp. Index. 46 illustrations in colour and b/w. Fine in fine dw. 2014 First edition, Three Rivers, New Delhi. An Album. 236pp. 4to. Index. In pictorial boards. Illustrated in colour and b/w. Many maps and annotated archive photographs of the city sector by sector. Fine. 2003 First edition, Sang-e-Meel, Lahore. 216pp. Index. Rulers of India series. Ex-university library. Very good internally. Boards rubbed and marked. 1892 First edition, Oxford University Press. Card covers. 4to. 6 colour plates tipped-in with an introduction. Fine. 1973 Reprint, Lalit Kala Akademi, New Delhi. The Indian Desert Thaar. 167pp. 4to. Index. Colour photographs by Vivek Anand. Fine in fine dustwrapper. 1982 First edition, Scorpion. The Indian Desert Thaar. 167pp. 4to. Index. Colour photographs by Vivek Anand. Very good in very good dw. 1982 First edition, Scorpion. 175pp. 10 appendices of sporting and military lists of names. 45 b/w photographs. Very good. Boards slightly bowed. 1957 First edition, Gale & Polden, Aldershot. 82pp with 56 full-page black and white plates. Card covers. Victoria and Albert Museum publication. Very good. Corners creased. 1959 First edition, HMSO. The Odyssey of Indenture. 274pp. Index. 38 b/w photographs. American descendant traces her great-grandmother indentured from Calcutta to Guiana. Fine in fine dustwrapper. 2013 First edition, Hurst & Co..
269pp. Index. 32 b/w photographs. An amazing story of a British agent's escape to Persia from the Bolsheviks of Tashkent. Edited with an introduction and epilogue revised by Peter Hopkirk in 1992. Fine. 2003 Fourth printing, Folio Society. 13pp. Stapled booklet. List of published records from the 17th, 18th and early 19th centuries. First issued in 1942. Very good. Annotation in ink. 1964 Government of Madras. 413pp. Index. 4 maps History of early nineteenth century penetration of Assam and Burma, 1792-1826. Much on the events of the First Anglo-Burmese War and the Burmese expulsion of refugees to the Arakan coast. Very good in grubby dustwrapper. Spotting to fore-edge. No date (after 1941), Calcutta. A History of Penang during and between the First and Second World Wars 1914-1945. 152pp double-column. Illustrations in colour and b/w. Fine in pictorial boards. 2010 First edition, AB&A, Malaysia. 159pp. Small 8vo. 21 engraved illustrations, mostly full-page by Edward Whymper. Travels in Kashmir and Ladakh. In the original decorated cloth. Very good. Front endpaper removed. 1894 First edition, The Religious Tract Society. 214pp. Index. 'Rulers of India' series. Bentinck was Governor General from 1828-35. Ex-university library. Very good. 1897 Third thousand, Oxford University Press. and the British settlement of the Madras Presidency. 233pp. Index. 'Rulers of India' series. Ex-university library. Very good. 1894 First edition, Oxford University Press. 130pp. 12 plates. The Gurgaon Experiment of Rural Improvement. The ICS author was District Officer. Conversations between the author and villagers cast as Socratic dialogues. Foreword by the Viceroy. See Dewey, 'Anglo-Indian Attitudes'. Very good internally. Some slight stains on red boards. Owner's name (R.B.Purey Cust). 1929 First edition, Oxford University Press, India. A Life of Ernest H.Wilson 1876-1930. The Great Plant Collectors. 154pp. Index. 4 maps. 21 photographs in clour and many in b/w. Fine in fine dustwrapper 1993 First edition, HMSO. 28pp sewn booklet. Card covers. 4 plates and illustrations in the text. Very good. Some foxing. 1937 Calcutta for the church. The Suppression of the Great Revolt. 194pp. Index. `Rulers of India' series. Ex-university library. Very good. 1891 First edition, Oxford University Press. A Woman Explorer in Tibet, China and Mongolia 1921-1925. 192pp. 4to landscape. An account of the travels of Janet and Frederick Wulsin with many b/w photographs from the expeditions in the collection of Harvard University. A beautiful book, lavishly produced. Fine in near-fine dw. 2003 Aperture. A Study in British Imperialism 1872-1969. 332pp. Index. Hailey was Governor of the Punjab 1924-28 and of the United Provinces 1928-34. Rubber stamp 'damaged' on verso of half-title but no obvious damage. This seems an excellent copy in a fine dustwrapper. 1992 First edition, Cambridge University Press. xxi + 266pp. Fine in fine dustwrapper. 2004 First edition, Atlantic Publishers, New Delhi. Its Romance and Wonder. 252pp Large 8vo. Card covers. Index. Many photographs in colour. Fine. 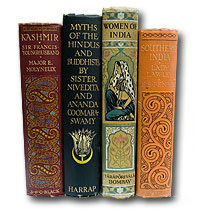 2014 First edition, Nyogi Books, New Delhi. 303pp. Index. 16 b/w illustrations. Folding map. An account of the end of British rule by long-serving Burma ICS officer.. Very good. Owner's name on endpaper. A few marks of small label removed from bottom of rear board. 1956 First edition, Faber. An Autobiography. 299pp. Index. Map. Account of his education, ICS appointment and posting to Burma from 1912 and then as an officer in the Scinde Horse in 1918. Very good, A tight clean copy. Owner's name on endpaper. Section cut from front endpaper 1952 First edition, Faber. Being the Life and Adventures of Fernao Mendes Pinto. 313pp. Index. 13 illustrations. 16th century Portuguese adventurer travels from India through Burma and Siam to Japan. Very good indeed. Slight spotting to endpapers. 1949 Reprint, Faber & Faber. 239pp. Index. First published in 1938. Powerful account of his experiences as Deputy Magistrate of Rangoon trying politically sensitive cases in 1930. The tensions between justice and empire. Ex-public library copy in the original binding. Two pages are misbound but all are present. Very good. 1953 New edition, Faber.